Each of the 33 bones of the spine has a large central canal opening for the spinal cord. Additional openings on each side of the spinal cord called foramens allow the exiting nerves to branch out from the spinal cord to the arms, legs and other parts of the body. Compression on the spinal and exiting nerve leads to inflammation which can produces many different types of symptoms depending on the severity of the compression. As with any spinal condition and depending on the severity of the symptoms, conservative care should always be suggested first before surgical intervention. Typically conservative treatment starts with anti-inflammatory medications or NSAIDS (Non steroidal anti-inflammatory drugs i.e. Ibuprofen), physical therapy, activity modifications and steroid injections. When conservative care is exhausted and the patients are still in pain, surgery is a logical step to relieve the pain. Traditionally, central and lateral recess stenosis is performed open with a large incision in the skin. A laminectomy and or facetectomy are performed to release the pressure on the spinal cord. 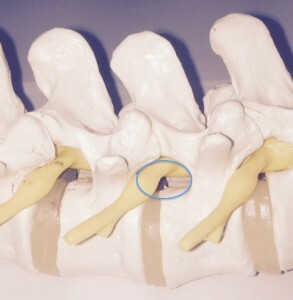 Unfortunately, this technique is invasive and leads to significant post-operative pain and recovery. With innovation and advances in technology, a less invasive endoscopic technique has been developed to address these painful conditions such as foraminal stenosis. Unlike traditional surgery, a small ¼ inch incision is made, muscle is spared and only dilated in order to gain access to the surgical site. The physician uses a working channel endoscope that allows for water and instrument to pass through the scope that provides a superior view of the anatomy and the spinal cord. The patient is under conscious sedation alert and comfortable throughout the procedure. No general anesthesia is needed and thus lower risk to the patient. The patient’s back is anesthetized with local anesthetic and a small ¼ metal cannula is placed into the foramen near the exiting and affected nerve root. The physician uses a HD camera attached to the endoscope to directly visualize the anatomy and uses surgical instruments to remove bone spurs and widen the foramen to relieve the pressure on the exiting nerve. After the physician has decompressed around the nerve root, the metal cannula is removed and a couple of stitches is all that is needed. Patient will recover for about an hour and then are encouraged get up out of bed and walk about. All patients are discharged from the surgery center within a couple of hours of surgery and can go home with their companion. Patients will follow-up the next day with our physician and are encouraged to return to work as soon as they are comfortable. Keep in mind that any heavy lifting or strenuous work is discouraged for a few weeks but light administrative work is fine. Want to get started and learn more about the treatment options available for your pain? Take a moment to interact with our Virtual Electronic Spine Assistant (VESPA). At Jasper Spine Institute we listen and work with you to develop a unique treatment regime that addresses your pain and symptoms. Our goal is always to provide solutions whether conservative or surgical so that you are able to return to the quality of life you want without the pain and suffering. * Always seek your physician’s opinion when it is safe to return to work. Also, light administrative duty is recommended until your physician approves of any physical demands at your place of work.